Type your Conway tracking number below, get live delivery information with our express tracking system. 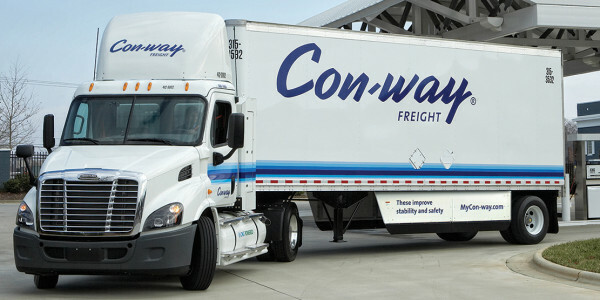 Con-way Freight delivers superior less-than-truckload (LTL) performance, comprehensive coverage and service excellence across North America. Our single network of more than 365 operating locations enables us to provide improved exception-free delivery, better on-time service performance and faster transit times in local, regional and national markets. We also provide superior transborder service to and from Canada, Mexico, Asia, Europe, the Caribbean and domestic offshore locations. XPO Logistics (NYSE: XPO) is a top ten global logistics company. We run our business as one, highly integrated network of people, technology and physical assets in 34 countries, with over 88,000 employees and 1,440 locations. We use our network to help customers manage their goods more efficiently throughout their supply chains. Our company has two reporting segments: transportation and logistics. Within these segments, our business is well diversified by geographies, verticals and types of service. Most important, we’ve hired top shelf talent – seasoned operators and executives who know how help our more than 50,000 customers improve productivity and reduce costs. October 30, 2015 – XPO Logistics, Inc. (NYSE: XPO) (“XPO”) today announced that it has consummated the previously announced agreement to acquire Con-way Inc. If you have problem with our express tracking system, please track your package directly on the Con-way website. If you get no tracking information from Con-way official website, you’d better contact them. If you have shipped through Con-way, you will have received a copy of your Waybill. The number is different between PRO Number, Shipper’s Number, Pickup Request, Purchase Order (PO), Customs Bond Number (7512) or customer reference number(s). You can track your Con-way express with each of these numbers. Con-way Truck on the road. Have no idea about XPO Logistics? Read Con-way reviews before choosing and write a review after sending your package with Con-way. If you have problem with our Conway Tracking system, submit your problem here, we will help you as soon as possible. Declare: We can NOT contact carrier or others on your behalf, we can only help you track your package with your Conway tracking number on official tracking system. TE Mechanicsburg at 1311 S Market St has exhausted our block of PRO numbers. We request a block of PRO numbers so we can load these into the system. Could you also attach a copy of the check-digit formula? We provide Conway Tracking service only. If you have any problem about Conway, we suggest you contact Conway official customer service for more help.